Welcome to the website for The Education Foundation for Buckeye Elementary School District. We provide support for whole-child education, committing funding resources to help our children be successful, healthy, safe, engaged, and challenged. We encourage on and off campus learning opportunities through teacher mini-grants and other enrichment experiences. The Education Foundation is a conduit for community, corporations, foundations, businesses, educators, and individuals who want to make a difference in the lives of children in Buckeye. By providing needed supplemental funding, we can extend classroom learning across the spectrum of student experiences in music and the arts, science, technology, engineering, mathematics, and reading. On behalf of all the members of the Education Foundation for Buckeye Elementary School District, welcome to our website. Your Foundation was established in 2015 and is a tax exempt, 501(c)(3), organization. Our mission is to provide funds to enhance the educational opportunities for every student in the Buckeye Elementary School District. All staff members have the opportunity to request funds thru our mini-grants program which, in turn, can be used to enrich their programs. We also fund projects that facilitate the whole child learning experience through on and off campus activities. We facilitate activities that expand community involvement from individuals, civic organizations, businesses, and corporations. Our funds come from your support of our fundraising activities. 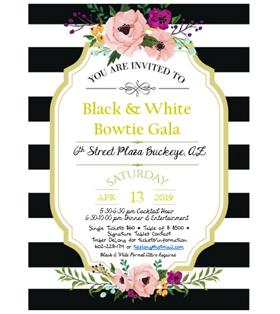 This year's annual gala is Saturday, April 13 from 5:30 p.m. to 10:00 p.m. Please see our gala letter for more details. Other fundraisers are being planned, allowing you additional opportunities to have fun with your fellow community members while supporting your Foundation. Each and every member of the Foundation thanks you for your continued support allowing us to make a difference in the lives of Buckeye Elementary School District children. As partners, we are making a positive impact on our community today that will continue into the future. Would YOU like to make a difference in the lives of children in the Buckeye Elementary School District? Join us today by volunteering, donating, or becoming a sponsor. Find out more on our Donate & Sponsor page. The Education Foundation for Buckeye Elementary District, Inc is a 501(C)3 nonprofit foundation serving students, staff, and family in the community.